Every year the run up to Christmas and the New Year takes me by surprise. Not in the sense that I don’t know it’s coming. I not only know, I anticipate it with glee! Just in the sense that I always forget quite how much extra there is going on. The constant round of fetes and school plays, carol concerts and office parties, dinners, drinks, and gatherings with every conceivable friend and family member. So many of these events involve turning up with a little gift. The children’s teachers, the host of the annual Christmas book group get-together, the few extras you always encounter on Christmas itself. I can’t bear to be the one who is empty-handed. I wouldn’t want them to think they had been forgotten, but a big expensive present isn’t necessary or expected. At times like these something homemade really feels right. It is so much more special than anything shop-bought could be. Having a stash of glamorous ribbon is my way to make sure it looks that way too. However, with the best will in the world, the last thing I have time to do is bake something fresh every time I need one of these tasty offerings. 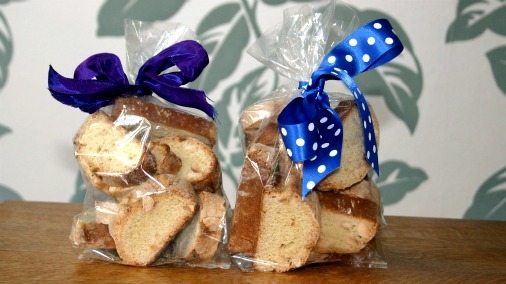 This is when I make biscotti, the perfect thing in so many ways. They are not at all one of those things that have to eaten just after you have made them. So I make them during the one snatched moment I do have time to bake. They keep beautifully in an airtight container for a good week or more. And are a welcome gift to any household. Something to offer the stream of extra people around at this time of year, with their tea, with the coffee that is keeping them going when Santa threatens to ask too much of them, or with a warming glass of vin santo at the end of a glorious winter meal. This recipe was given to me by my friend Magnus. Yes, I know, Magnus isn’t a very Italian name. A wonderful Swedish man, he is big-hearted and fastidious about food. He makes these weekly, so he always has a jar ready to welcome friends, and so he never runs out of his favourite snack. Sounds pretty Italian to me after all! This is a blinding recipe, utterly delicious, crunchy almondy and just enough lemon zest lift it to the next level. One of those that I have made and made from the minute I had it. The card it is written on is caked in sweet floury dough. It is superbly easy, but when the results are presented, prettied up in that ribbon-tied cellophane bag, they will always illicit an awed response, as though it was evidence of tremendous culinary prowess. It isn’t, try it, enjoy! Top Tip: This recipe makes two long loafs. Enough to make 3 or more bags for gifts, depending on how generous you are feeling, and how many don’t make it as far as the bags! 200g blanched and very roughly chopped almonds. 425g plain flour (you may need a little extra for dusting). Preheat the oven to 175C (165C fan oven). Toast the almonds in a dry frying pan until golden in colour. Blend the egg yolks, sugar and vanilla in a large bowl. Beat the egg whites and salt until firm like meringue and carefully fold into the yolks and sugar. Mix the almonds and lemon zest and fold them in too. Mix the flour and baking powder together and add them to the mixture. Work the mixture for a minute or so and then make it into two long fat sausages. Put them onto a baking sheet, side by side, into the oven for 30-35mins. Take them out and cut into slices as soon as they are out of the oven. Lay these individual biscuits out on drying racks and then let cool completely. Variation: You can vary the extras you add to the dough. My favourite alternative uses hazelnuts and dark chocolate chunks in place of the more traditional almonds. Delicious! 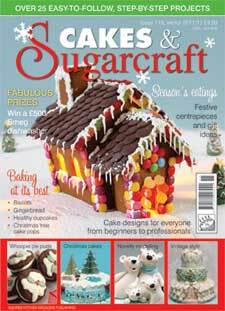 This article first appeared in Cakes & Sugarcraft Magazine issue 115.